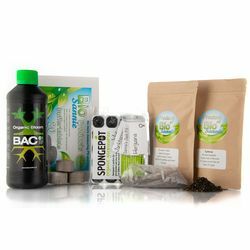 Here you can find various grow kits suitable for different conditions.100% natural nutrients and additives which can be used for a tasteful harvest and the highest possible yield. All kits have customized sharp pricing and are ideal for a small crop. The kits are designed to provide nutrients for a full season or indoor culture and to ensure that your plants get the most out of the light they receive. Photosynthesis can best be converted if your plants are healthy and have beautiful green leaves to catch the sunlight. 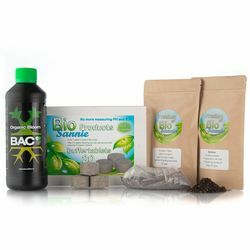 The products are convenient to use and very easy to dose, mycorrhiza symbiosis and the buffer tablets need to be put directly into the soil, after which you only need to add biweekly bacto and, once the blooming starts, the liquid organic food from BAC With these products it’s as simple as that. When these 4 steps of organic nutrients are used, the soil life will ensure that the available nutrients are being absorbed when the plant requires it. The soil life does this, among other things, by adjusting the acidity of your soil where necessary. For this, the lime reserve of your soil is being used and the buffer tablets will be able to supplement possible lime deficiencies. As a result, it is not necessary to acidify or measure the EC (conductivity or amount of dissolved salts in your water). In fact, it’s better not to do so at all in combination with organic nutrients since organic nutrients are known to be unstable and therefore very difficult to measure. The only thing you need is soil to put your plants in. Make sure to use soil with as little added nutrients as possible to start a flourishing soil life. If you are considering re-using the soil you used, also called "topping up" then it is recommended to mix Bio-char through your soil at the beginning of your cultivation so that it will remain present in the soil for the entire growing cycle of the plant. When reused, the bio-char will provide a direct impulse of beneficial soil bacteria and mycorrhiza fungi. The bio-char also stimulates the surface amount of your soil since it’s micro porous and functions as a highway for soil life.